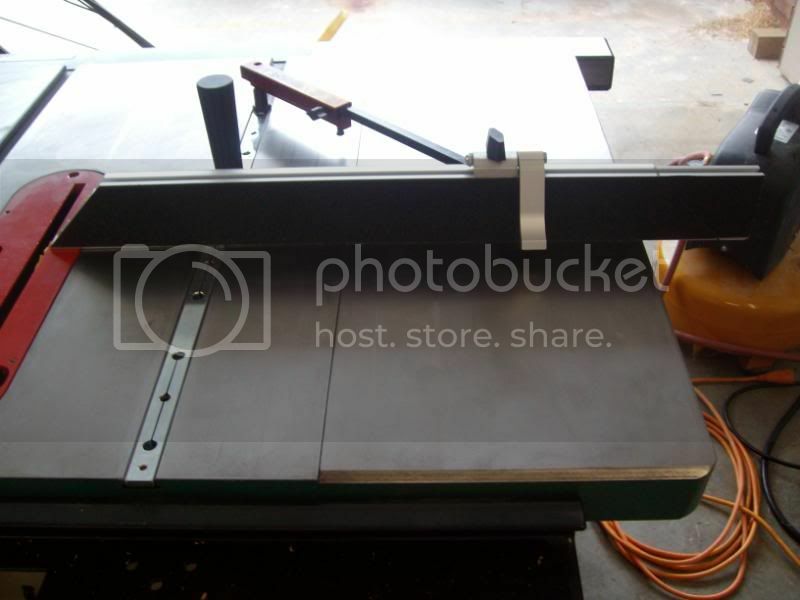 I know Schummie just did a review of this miter gauge yesterday….But I just got mine also…and thought I would tell you what I thought so far. First this is a great miter gauge that came out of the box DEAD on accurate. 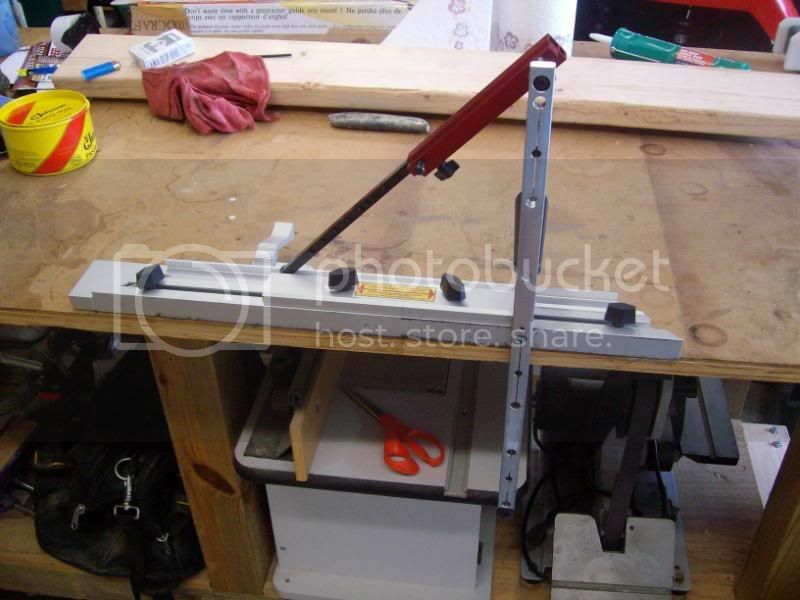 It was extremely easy to assemble and adjust to my saw. Second…other than saying how great it is and accurate it is (Which by the way I already said…lol) I figured I would show a few things. The non skid tape they send covers the fence from front to back and top to bottom with a little that hangs over all the way around. (This pic shows a little dark) The directions say to apply the tape and to cut off the over hang with a utility knife..I will add this. 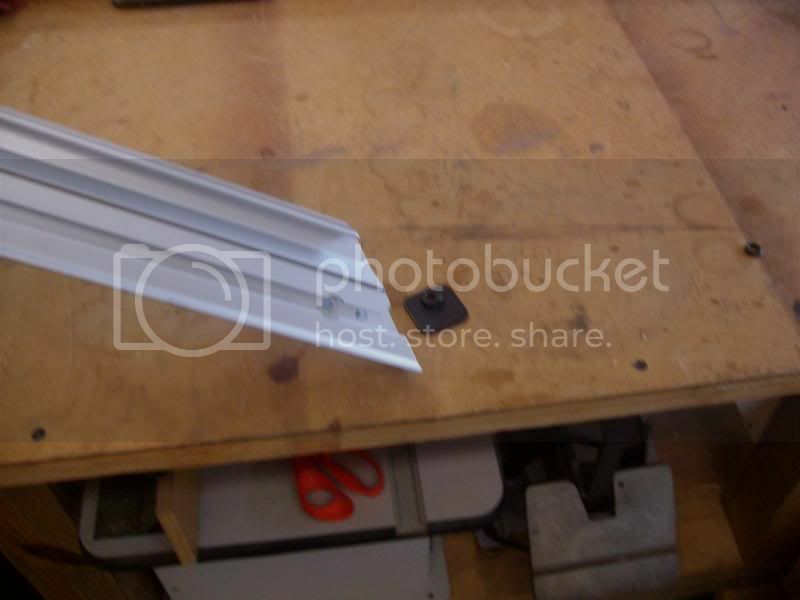 I would recomend extending the sliding extension out about a 1/8 of a inch (There is still enough non-skid tape to cover everything)...this will allow you to take your utility knife and cut down between the bevel instead of “Feeling” for the angled slot. You can also see the flip down stop that is extremely well thought out. 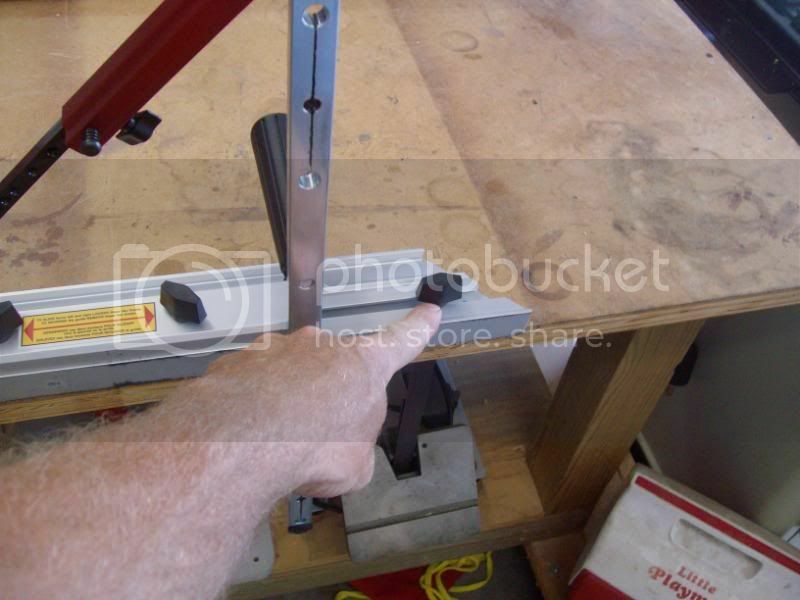 IF you are holding the miter gauge in your hand and it is at a angle….a small wedge type lock and the O-ring will fall out…if you look in the pic of me holding the fence at a angle…you will see the lock and a O-ring laying on the bench that fell out. 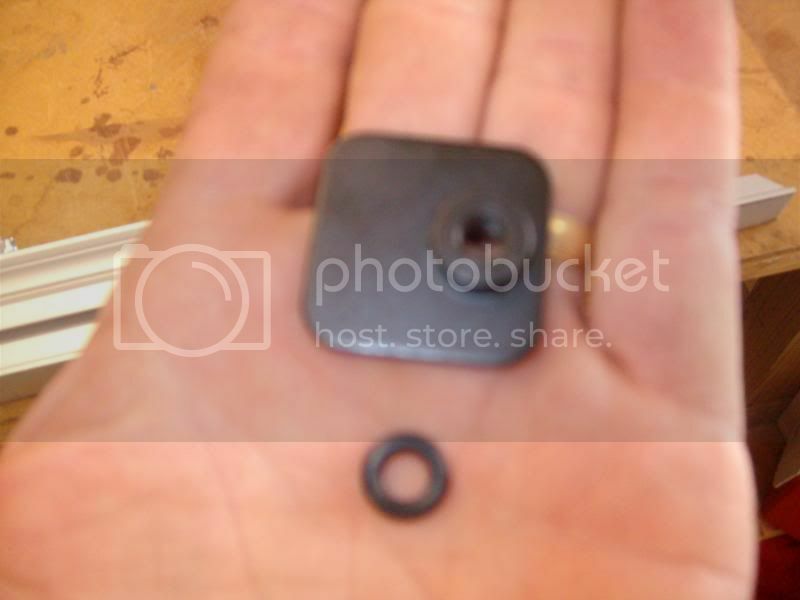 What I did after putting it all together is this….I took it back apart…and put a VERY small dab of rubber cement on the O-rings (There is one on both sides so you can put the extension on both sides and then lock it down) and then put the O-ring back onto the lock. (Miter guy AKA-David Osborne.. I hope this does not void the warranty !!! lol) I did not “Smear rubber glue all over it…but put just a small drop on it to keep the O-ring from falling off of the lock in the future…I used rubber cement that you use to repair a bicycle tire with. They also send you a strip of “Slick Tape” to put on the bottom of the fence to help it slide across your table top with ease. But not one on the back of the bar, Also in this pic you can see the “Expansion slots” that are in the miter bar…there are three of them, front, middle and back…once you have your bar in your table slots…you screw the allen screw up or down to “Expand” the width of the bar to take out all the play. 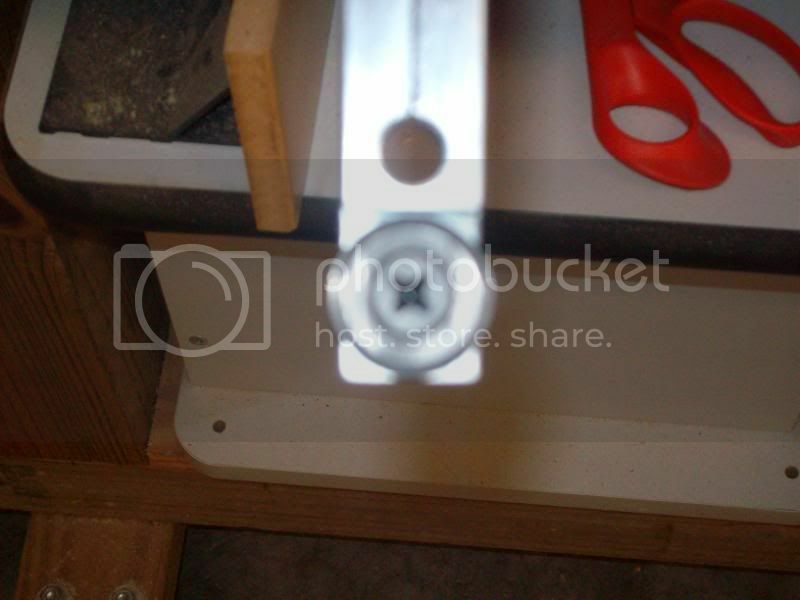 While adjusting my new gauge, and setting everything up….I noticed as I expanded the bar to take out all play…that it “Stuck” in a few places…this was not the bar…but discovered a few small “Burrs” in my miter slots on the saw. A small sanding block on its side wrapped in sand paper slid up and down the slots a few times smoothed everything out…and this thing fit like a glove. Good review Don. I need to re-invest in a better saw and get rid of this cheap Craftsman saw I now have. Wish I had never got rid of the grizzly I had but no room for it in a small shop such as mine. Don old buddy. I got one of these right after I got the PM table saw. I got it for two reasons, First, Norm has one and, as most of us know, “if it’s good enough for Norm…” Secondly, I read reviews on it both here at LJ and also other sites. All reviews were positive. Thanks for sharing your experience and advice/tips with everyone. I am curious to know if you experienced any scratches to your TS since using this accessory? I read a review on this product by another LJer but I can’t seem to locate it. He said he got a few scratches as a result of some of the grit from the non-skid backing coming off and then being dragged across the table. His recommendation was to use a belt sander eraser or some such item to go back and forth across the non-skid tape several times. I personally have several of these scratches on my new TS (pauses to wipe stray tear from eyes). I noticed above in your pictures, the ones where the gauge is laying flat down, there are black streaks. That is what happened to mine. I think the grit gets trapped by the clear tape on the bottom and then gets pushed across or pulled back along the TS. As you can see there is black streaking along both the front and back edges of the clear tape. Anyway, I e-mailed Osborne Mfg. about this, asking if he has other reports of this problem, and got a speedy reply from David Osborne. While I appreciated him taking the time to reply, I can’t say I was delighted with the end result. He never acknowledged it as being a reported problem. He did say it is possible some grit may have fallen off but the material is used on stairways for traction and has a long life expectancy. He said it should be installed 1/16th to 1/8th inches up from the bottom of unit. Mine had been installed in this fashion and I sent him a picture to illustrate it. He responded by saying I had the necessary clearance on it. My only other thought is that when you score the tape to fit the angle in the fence, you are obviously exposing an edge. Sort of like cutting a carpet. There is going to be some grit loosened. I ended up removing the clear tape and replacing it. Given the black streaks I see on yours, you might want to do the same. All that being said, it is a wonderful accessory and as you said, “dead-on accurate out of the box”. Many LJers have this item as you will soon see by their comments. Good luck with yours. I agree Lenny…I to have noticed the black “Scuff” marks across the bottom of the fence….I thought I might lay a flat edge across the bottom and maybe remove a little less than a 1/4” off of the bottom of the non-slp tape. And I am also going to replace the clear tape once I am sure that no more grit falls off. And I agree with you that it is a wonderful accessory…I guess it just takes a little “Tweaking” to fit all the differing brands of saws out there. Thanks for a most excellent review. Your review was so engrossing, I feel like I just got one myself. 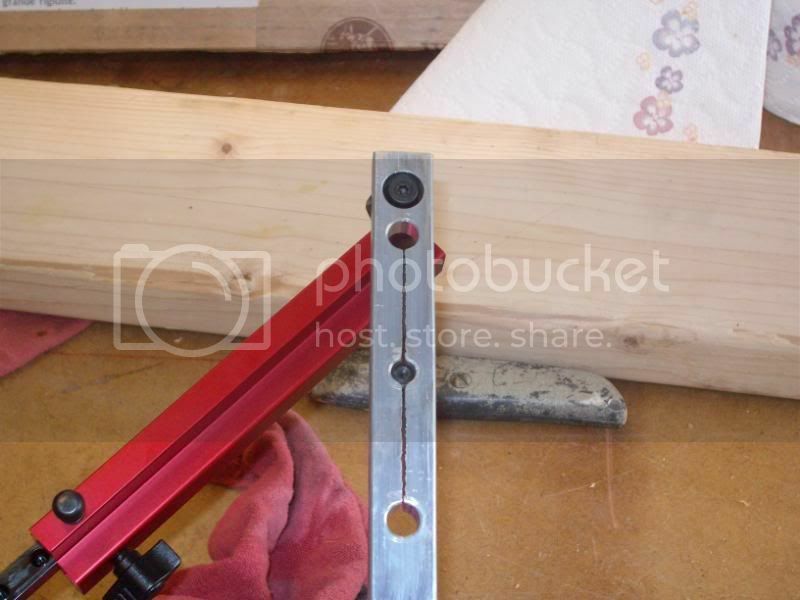 I can tell you have looked forward to this miter gauge and hope it serves you well. ?? I bought mine about 6 months ago, I didn’t receive any grip tape for the front or slide tape for the bottom. is that a new addition? I bought mine a year ago and it came with with both. I love mine and should add my own review. i think we are all as informed as we are liable to get . asembleing things bias ) . as it was pinching the bar differently in different places . to all of the guides , and favorites of each type . in the end , this tool is exelent ! price , utility , ease of use . I have also recently jumped on the Osborne band wagon and purchased one a few weeks ago. I havent had much of a chance to use it but I get it set up and made a few test cuts. Like the others it was dead set right out of the box. You’re gonna love it!! Let me tell you, once you’ve built a few projects with it you’re going to ask yourself “How did I ever manage without it?” I love mine!! Now your getting more big boy toys and this is good one I’ve enjoyed mine for years, Super review bud. I bought this when the eb-3 first came out, I didn’t get the non skid tape or the slip tape for the bottom, but bought both and put them on. I got scratches on the table saw too, I tried scrapping the non skid tape for loose particles and also changed the slip tape a few times. I check the bottom for stuff embedded in the tape from time to time and clean it or replace the tape. After the first few scratches it made me cry too, but now have learned to live with it. All in all I love the miter gauge, Its probably the best accessory I have bought for my saw. I would buy it again. Thanks for all the replies guys….Well I have spent a few more hours in the shop with it tonight…all I can say is …Am I ever glad I bought this thing…..WOW…talk about a nice tool. I ran this thing right up to my saw blade (around a 1/8” or less)...talk about nice. So far I like EVERYTHING about his Gauge (Except the slick tape on the bottom…will try to come up with something better in time). I know I said it was accurate in my review…..but crap…this thing is ACCURATE !!!! Hey Don, thanks for this review. I’ve been tearing my hair out trying to get good square cuts so I’ve been looking at miter gauges lately. 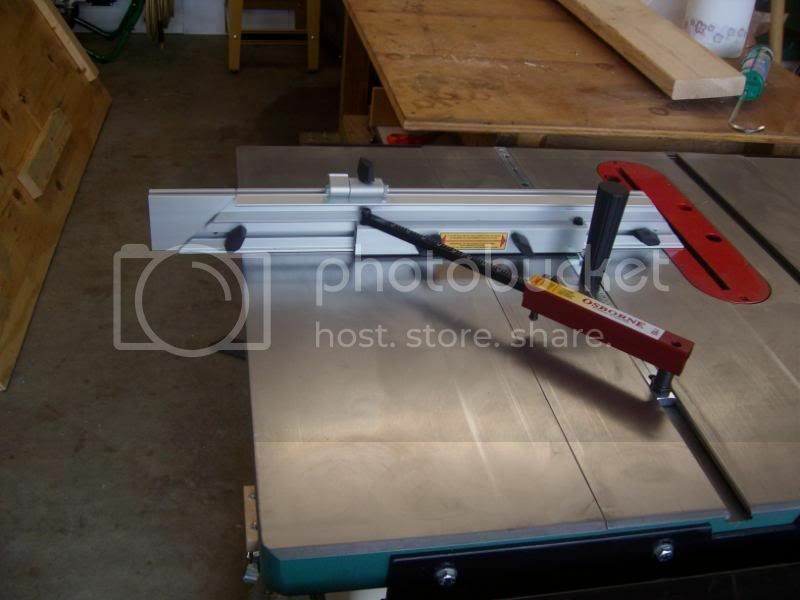 I’ve got the Rockler crosscut sled and can’t get an accurate cut on that thing to save my soul. 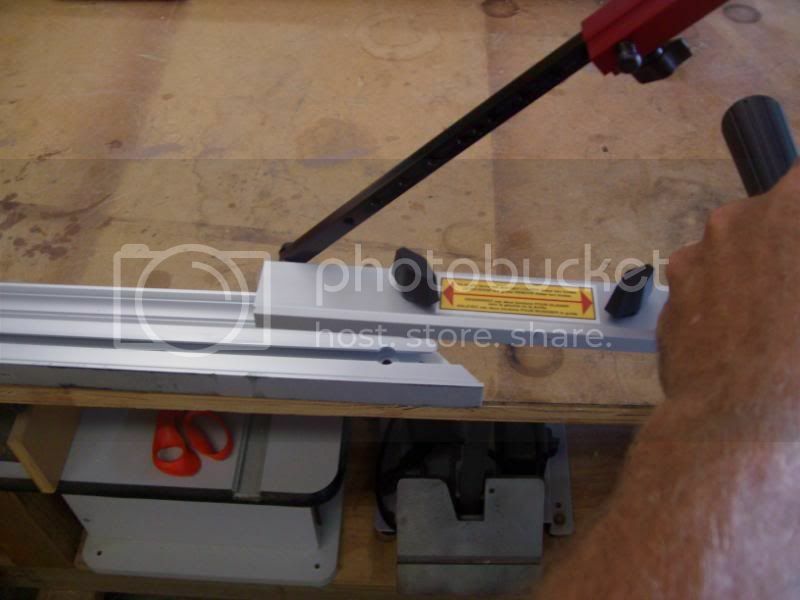 I’ve had to resort to my SawStop miter gauge to get anything near an accurate cut. Based on your review and the other reviews on LJ’s for the Osborne EB-3, I just ordered one from their website. This thing will make a huge difference for me in the future. Thanks again for the review. Hey fellow Okie….Glad I could help.